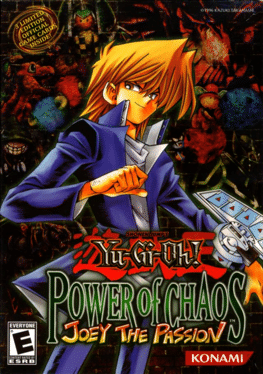 This game is featuring Joey Wheeler as the opponent, adds new cards, new dueling choices, new dueling options and more Decks for the opponent, making this the Power of Chaos game with the most content. The cards from the previous two Power of Chaos games, if installed, are included. New game features include a ranked difficulty for the computer opponent, denoted by a star gauge in the Duel menu, which ranks from 1 star to 9. As you win duels, the difficulty increases, and the opponent swaps his Deck for a more potent one every time this happens. Later difficulty levels (8-9) allow the opponent to use different Decks in that same level. Losing consecutive duels results in decreased difficulty for the first time in Power of Chaos games. Other options include allowing the opponent to use cards from the previous two games, increasing the difficulty. Also, the option to make many Limited cards Forbidden is given, making the game more balanced. One other new addition to the game is that when you win cards that you already have, you may have a choice of getting different cards, or keep the ones you've earned. This can only be done when every card you win in a match or one card in a single duel is a common card, not new. Last, you can also duel a friend via LAN or via Gameranger.